The young hold the key to the future. So it would be natural for the synod on young people underway in Rome to consider the future of Christianity in an era that is more and more post-Christian. It is the same consideration that is behind “The Benedict Option” by the American Rod Dreher, the most widely discussed book on religious issues in recent years. The following commentary enters into the thick of this discussion. With original and penetrating reflections. 1. There has been a great deal of discussion in Italy over the now-famous book by Rod Dreher, “The Benedict Option,” also translated into Italian, especially after the tour that its author made in our country for the purpose of presenting and discussing it. But I get the impression that the debate has been focused mainly on the proposal with which the American writer has distinguished himself: the creation of communities that would strive to preserve and develop the Christian tradition and in some way keep it alive in view of a future return, while the surrounding world is not only clearly losing its Christian roots but threatening them with hostile behaviors. The function that was performed precisely by the Benedictine monasteries of the late Middle Ages. It seems to me that less attention has been paid to the political-cultural background of this proposal and to the historical analysis underlying it. This comes as no surprise: from the very first lines of the book, Dreher calls himself “a believing Christian and a committed conservative.” The galaxy of political, cultural, and religious conservatism is for the most part unknown to Italian public opinion and to its media. One of the great victories of the opposing cultures has been, in fact, of a semantic nature: to surround that word always and in every case with a negative meaning, concealing its true scope. The same thing happened in the ecclesiastical camp. Perhaps the biggest achievement of some of the journalists who closely covered the sessions of the council Vatican II (among the Italians, Giancarlo Zizola and Raniero La Valle) was to transmit to the media an image of the conciliar clash as a fight between “conservatives” and “progressives,” entangling the former in an aura of negativity. In part because those outside the Church who felt they were on the side of “progress” coopted the latter right away for their side: think of the underhanded intervention in the conciliar debate made by the communist leader Palmiro Togliatti in his famous speech in Bergamo on March 20, 1963. 2. A “conservative” believes that man is a social being, situated in a community that gives him a “status” and almost an identity; that he has duties toward this community, of an importance at least equal to his rights; that true morality consist not so much in self-actualization as in overcoming his own particularism in view of a “common good,” which however does not remain abstract, but is identified in something concrete: family, land, nation. These entities do not remain fixed and rigid; like everything else, they develop and change, but slowly and harmoniously: they do not admit upheavals planned in fantasy land, on the basis of abstract demands of social engineering. Within this perspective, the conservative is well aware of the importance of authority and order, in that he has an organic view of society, in which each has a function to perform for the good functioning of the whole. He therefore believes in the role of hierarchy, of the necessity, that is, of different levels of prestige and influence. He does not reduce relationships to merely economic or utilitarian values, because he harbors distrust toward the pure law of the market (even if there are “marketist” conservatives). For him society is made up of customs and traditions, which go far beyond that which is immediately rational and useful. An essential role is in fact played by the religious element, the crumbling of which has disastrous consequences for the whole social structure. Contemporary man – at least in the West – is therefore alienated, in that he is cut off from a positive relationship with other men and from the moral aims that the community proposes. As Dreher points out, the “déraciné,” the uprooted one, abandons objective moral norms; refuses to accept any sort of “narrative framework” that is binding from the religious or cultural point of view but does not stem from his own will; he repudiates the memory of the past as irrelevant; he distances himself from the community as also from any other social obligation that he has not chosen. In this context, even the Christian religion, even the Catholic one, undergoes an analogous metamorphosis: it becomes a therapeutic moralistic deism, in which God is a sort of “imaginary friend” or benevolent psychologist, who guarantees us help when we need it, wants us to be happy, does not crush us under excessive burdens, because the fundamental aim of life is to be happy and have good self-esteem: thus the certainty of a paradise that awaits us after death. Hell must be empty. 3. Rod Dreher is therefore a critic of modernity: he does not reject it “in toto,” but he sketches a critical inventory of it. This aspect is also in contrast with the culture prevalent in our country, in which a positive relationship with the famous “modernity” has become almost an obligation for conferring dignity on cultures and political positions. Modernity does not identify an historical phase, but has become an ethical-political value. 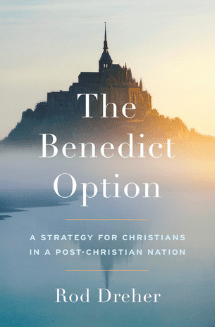 The keywords of “The Benedict Option” have instead a deliberate critical value: rule, order, prayer, work, ascesis, stability, community, hospitality, balance. Even a nonbeliever who were to decide to live as if God did not exist would have no difficulty making them his own: how many figures great and small, of the past and of the present, without calling themselves Christians “tout court,” have lived by putting them into practice! An analogous critical framework is presented by the pedagogical system that Dreher proposes. The American writer demonstrates a marked distrust toward the educational priorities prevalent today in the public schools, but he also entertains no great illusions about how the “Catholic” schools are run, from primary to university. In the face of the overflow of the technological culture and cultural consumption of the “Erasmus generation,” he re-proposes the classical pedagogy elaborated by Dorothy Sayers in 1947 in “The Lost Tools of Learning”: in practice, a Christian-classical school, based on a return to the roots of Western culture, both Greco-Roman and Christian, which had already met in late antiquity and then in Italian Humanism. Yes, “Western,” because our young people – Dreher insists – must be immersed in the history of Western culture, not vaccinated against it: in the conviction that it has elaborated the fundamental concepts of life, ignorance of which will have an enormous cost in the evolution of our societies. 4. But how did we get to this critical phase? Here Dreher re-proposes an historical vision that is not particularly original, with the exception – as we will see – of its outcome. He essentially adopts the strategy that the proponents of modernity have elaborated for centuries and that their adversaries – including traditional Catholic thinking – have essentially made their own, obviously changing its character: what for the one was a journey of progressive emancipation and illumination, for the other was an advance toward the abyss. But the stages were more or less the same: the crisis of medieval theological thought, fifteenth-century Humanism, the Reformation of the 1500’s, the scientific revolution of the 1600’s, the Enlightenment of the eighteenth century, the industrialism and consequent modernization of the nineteenth century. In this last phase the proponents of modernity began to disagree in their predictions: for some, the outcome of this age-old process of emancipation from mythical thinking and from transcendent religion was liberalism. But for others another stage was necessary: because the journey would be continued toward a communist society. In Italy, between the two wars, there was no lack of voices that identified fascism as the summit of “modern thought.” And once again traditional Catholic thought, which also emerged in the pontifical magisterium, did not hesitate to fight every step of the way against liberalism, communism, and fascism, precisely as extreme stages of modernity. But these are all discussions from the twentieth century! Dreher identifies two different outcomes for today: the sexual revolution, and the technological. The first is the process that began around 1960 and led to the abandonment of the “social” conception of sexuality that until then had been proper to Christian thought, but – I would say – also to common sense, toward a complete sexual individualism. The second, developed after 1980, is that of biotechnology, the internet, smartphones: in short, of information and technology consumerism. The American writer’s judgment on the “sexual revolution” is radical: it was catastrophic for Christianity – as well as for, we might add, traditional morality – because it struck at the heart of the biblical doctrine on sexuality and the human person, demolishing the Christian conception of society, of the family, and of the nature of human beings. In short, it radically changed the presuppositions of social life as they had been established over millennia. Dreher does not propose to his readers an impossible return to the past, but a sort of “technological ascesis.” Both on the pedagogical level (how we present technology to our children, with what digital devices we equip them, what alternatives we present to them) and in our daily life: all of us, including the “secular,” can achieve a lifestyle that exorcises the most pervasive aspects of the “technological revolution.” To this end, of course, there is a need for “spiritual exercises” (in the sense of Pierre Hadot): for example taking on, for one or more days, a digital “fast” could be a useful ascetic practice for rediscovering oneself. 5. In his book Dreher never cites the work of Michel Houellebecq, the great and controversial French writer, but he has repeatedly stated that he considers him an interlocutor in his work. I believe that he is right: in his best novels there is more history and philosophy than in many professorial volumes (one could read in this regard the book by Louis Betty “Without God. Michel Houellebecq and Materialist Horror” released in 2016). Houellebecq had already dealt with the “sexual revolution” in his 1994 debut novel “Extension du domaine de la lutte,” in English “Whatever.” This is not the place to explore its analysis, suffice it to say that for the French writer it is the extension to the sexual sphere of the unbridled competition and economic individualism typical of the pure market society. That is, there exists a parallel between uncontrolled economic liberalism and absolute sexual liberalism: both produce phenomena of absolute impoverishment, widespread forms of exclusion. The readers of “The Elementary Particles” know how this happens, in what direction it develops and who is – so to speak – its promoter: it is certainly not the one desired by Dreher. But beyond the narrative plot (it must always be remembered that we are talking about a novelist and poet, not a professional historian or philosopher), it is important to register his rejection of a continuous and inexorable journey of history, of a unidirectional conception of historical development, which is instead typical of “progressivism,” including the Catholic form. Ruptures are possible, and what seems to triumph today, as has been stated, can decline. I don’t know to what extent Dreher has been influenced by this vision, but at the foundation of “The Benedict Option” one perceives something analogous. It is not to be taken for granted that the era that began with the “metaphysical mutation” of the first centuries of the modern era and has led to the current Western dechristianization is “forever.” The complete unfolding of its consequences could lead to a new rupture: one must be ready for this moment. This is why it is important to preserve the Christian heritage intact in order to be able to present it again in a mutated world: unlike Houellebecq, the American writer maintains that this is possible. To preserve it by working together with the humanity of our time – Dreher says – not in idleness. At the bottom of his vision there does not seem to be, therefore, a disconsolate pessimism or – as has been said – the perception of a state of siege: but the reasonable hope for a revival. 6. As can be seen, the plate that the American writer offers is for strong stomachs. It is true that certain Italian experiences have inspired some of his proposals, but the observer cannot avoid a concluding question: can these find true interlocutors in the Italian reality? I don’t mean in the hierarchical Church, but – what do I know? – in specific cultural environments and in certain ecclesial groups? Will they want and know how to come down, perhaps critically, to the terrain of that Christian “counterculture” proposed by the American writer?